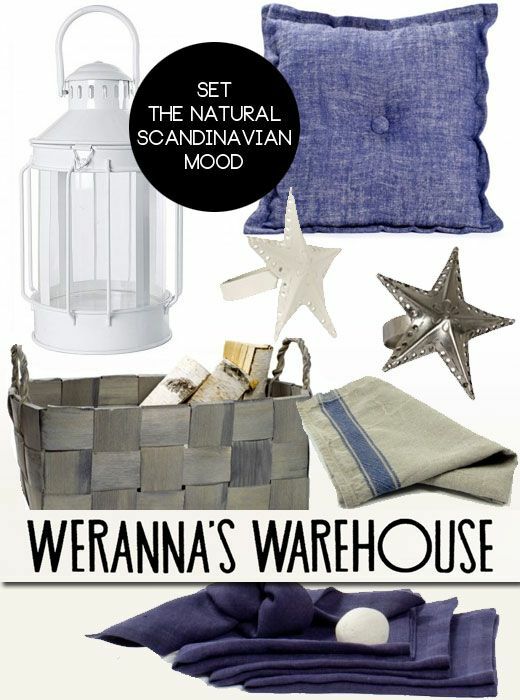 I’m excited to introduce you to a new interior design store Weranna’s Warehouse offering you the best of handmade Scandinavian products, heirloom quality linen mixed with the trendiest home accessories carefully picked from around the world, but maintaining the Scandinavian thinking: things have to be good quality to last for long and be esthetically pleasing. Weranna sells products that are made with respect to fair trade practices, made with natural materials and most likely handmade by artisans from around the world. They support women’s rights and entrepreneurship, and the shop owner herself is a mother of three. 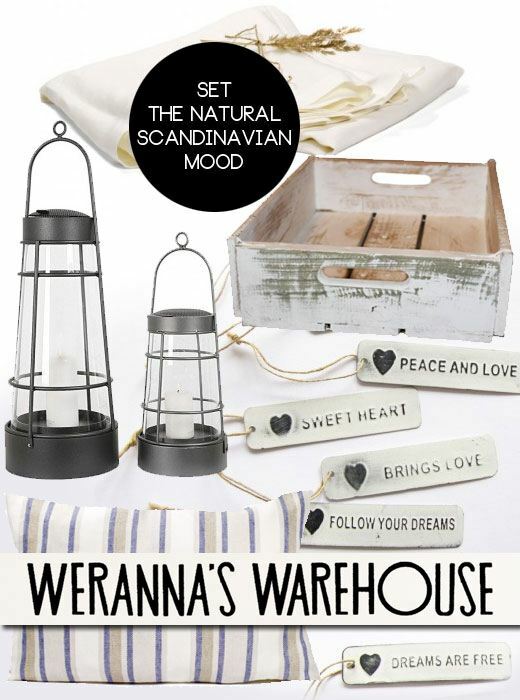 Weranna’s ships worldwide, but is based in Finland. 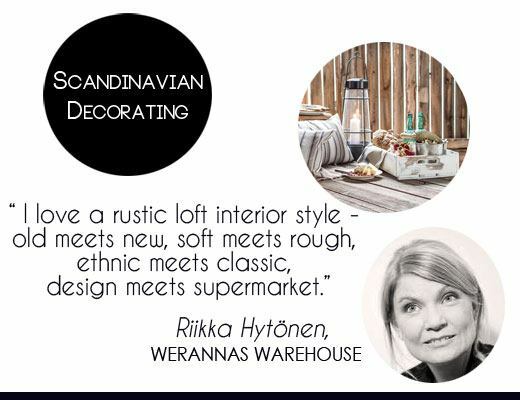 Today we are getting tips how to create a natural rustic Scandinavian style summer party at you home from Riikka Hytönen of Weranna’s Warehouse. Riikka is originally from Finland, currently living in Stockholm, Sweden. As she says it, her thousand small and larger projects going on any moment related to the kids, the house, Swedish learning (ouch!) knitting (too many) and reading (not as many). 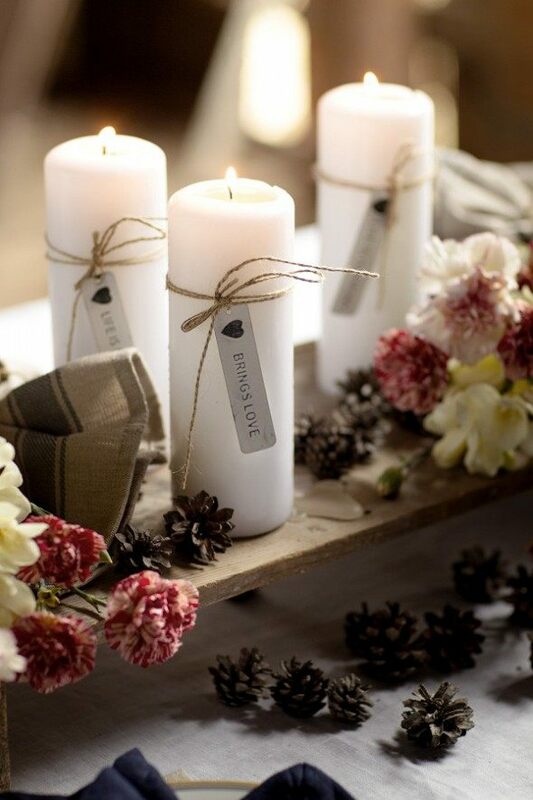 This Scandinavian Summer Party feature was shot in Riikka’s summer house – in a boat shed! But you definitely don’t have to own a summer house nor a boat house – you can create the same look in your home or in your yard. I created something very similar in our backyard on our deck. 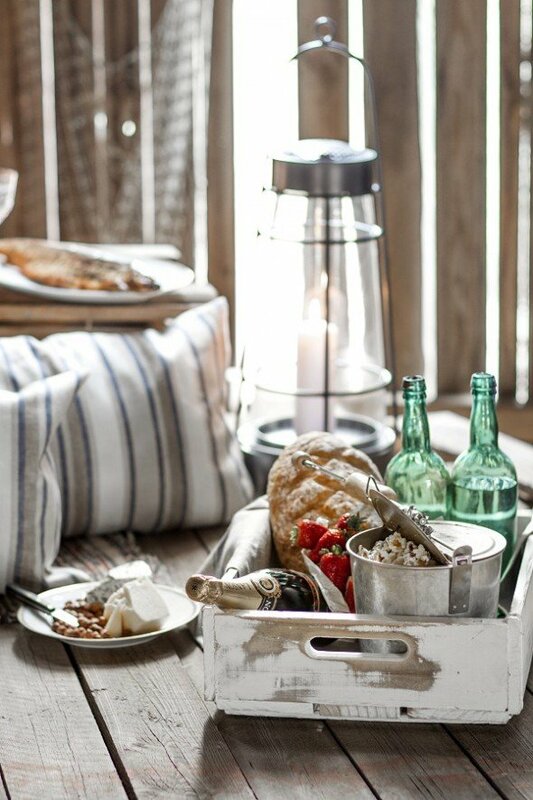 But the entire look takes you to the mindset and feeling of a summer house — lazy days, easy cooking, never-ending sparkling wine supply and setting the table with what ever you have in hand and serving fish from the sea and fresh veggies and fruit from the garden. By the sea. Weathered wooden cottage, all grey from years of sunlight and sea water splashed to the walls. A small deck or boathouse. A cozy corner built with old fishnet and old apple boxes, they are perfect to have around. Have a variety of nautical lanterns in all shapes and forms and ages around us to be lit when the evening starts to get cooler. We bring everything needed to our perfect spot in hand-made chip-baskets. As we are at the summer house, the chairs never match. They are whatever can be found. The table is perhaps put together of old wooden planks found in the shed. In the corner an old rattan chair with a blanket made of grandma squares. Linen cushions. Linen blankets for all. Linen table cloth. 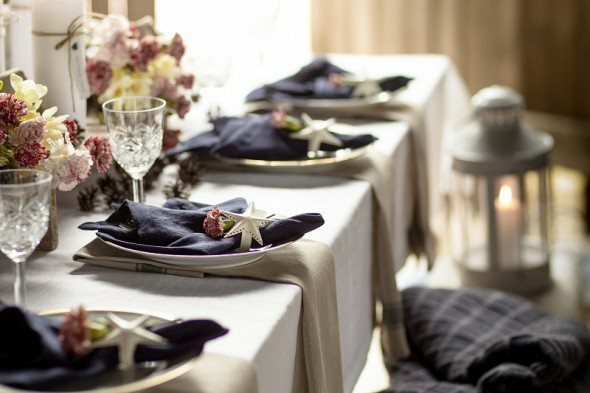 Linen napkins. White, linen, blue. A splash of aqua or turquoise perhaps. Or bright pink peonies in the middle of the table with lots of green found in the garden. To drink? Ecological champagne or sparkling wine. Perhaps throughout the meal. This year I would also go for a punch made of home-made fruit juice. With a touch of lime and fresh mint (from your own small herb garden, of course). Lots of frozen strawberries and melon scoops as ice cubes. 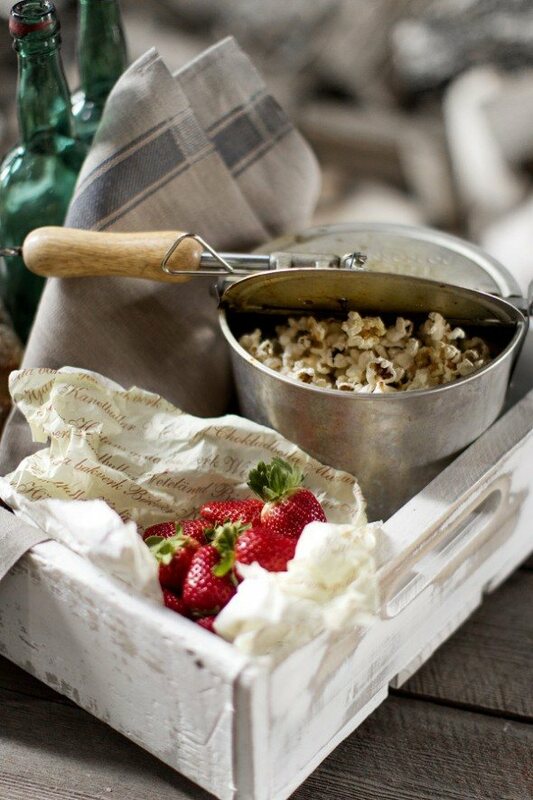 Popcorn. Keep it simple, and inexpensive. Smoked fish. Sour dough bread. Strong local cheese. Grilled Asparagus with feta or parmesan cheese and bacon, and olive oil, salt and pepper. A huge salad with edible flowers on top. As a dressing I would have ecological raspberry vinaigrette or similar. For dessert: Strawberries and whipped cream. Playing cards. Enjoy the summer sun. 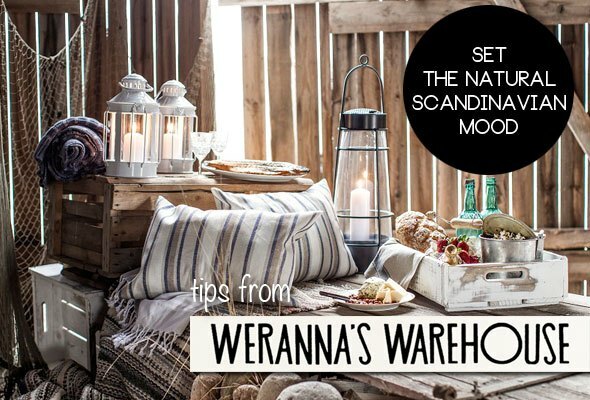 Most of the products to create this mood for your summer can be found at Riikka’s store at Weranna’s Warehouse, but the appeal of the entire look is to use old items you already have, flea market finds, and mix them with heirloom linen or new textiles to bring the old things alive. See the products and links to purchase them below!